Western blot analysis of extracts from mouse brain and rat brain lysates using NRCAM (D2H1T) Rabbit mAb (upper) and β-Actin (13E5) Rabbit mAb #4970 (lower). 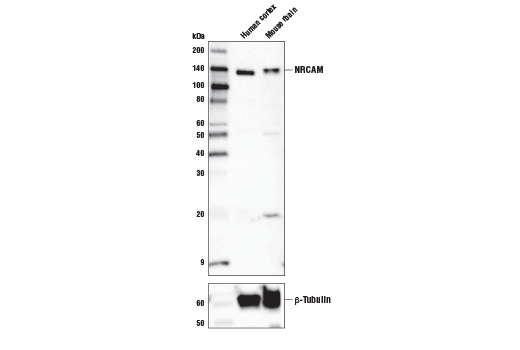 NRCAM (D2H1T) Rabbit mAb recognizes endogenous levels of total human NRCAM protein. Monoclonal antibody is produced by immunizing animals with a synthetic peptide corresponding to residues near the amino terminus of the human NRCAM protein. Neuronal Cell Adhesion Molecule, or NRCAM, belongs to the immunoglobulins Cell Adhesion Molecules (CAM's) superfamily (1). NRCAM, an ankyrin-binding protein, contributes to the neurite outgrowth by providing directional signaling during axonal cone growth (2, 3, 4). Additionally, it plays a role in mediating the interaction between axons and Schwann cells and contributes to the formation and maintenance of Nodes of Ranvier (5, 6, 7, 8). NRCAM also plays an important role in the establishment of dendritic spines in developing cortical neurons (9). NRCAM is expressed in non-neuronal cells, mostly in endothelial cells (10). Grumet, M. et al. (1991) J Cell Biol 113, 1399-412. Lustig, M. et al. (1999) Dev Biol 209, 340-51. Dzhashiashvili, Y. et al. (2007) J Cell Biol 177, 857-70. Fitzli, D. et al. (2000) J Cell Biol 149, 951-68. Feinberg, K. et al. (2010) Neuron 65, 490-502. Amor, V. et al. (2014) J Neurosci 34, 5089-98. Devaux, J.J. (2014) Rev Neurol (Paris) 170, 819-24. Martin, P.M. et al. (2008) J Neurosci 28, 6111-7. Mohan, V. et al. (2018) Cereb Cortex , . Aitkenhead, M. et al. (2002) Microvasc Res 63, 159-71.